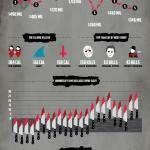 Quick Horror Movie Facts Infographic You Should Know! Here are some quick facts that every horror fan should know about horror movies. Use them to tease your younger siblings, significant other, or just pester your teenagers. Topped with the highest grossing horror films, profits per year, top 3 killers by body count, calorie killers, and top 10 most popular. See how many you get right! Spoiler: Jaws and The Exorcist appear the most often at 2 times.